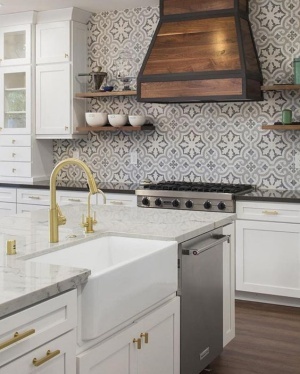 What are materials that make backsplash renovation easier? Paint. Such a simple solution, but it might just do the trick. This is especially the best route to go if you are satisfied with the quality of backsplash, but not quite as happy with the aesthetics. Paint can be used to change the look of any material from metal to wood. Using paint allows you to design out of the box. You can add as many colors and accents as needed. Not to mention, it is also the easiest fix when it comes to upgrading your backsplash. Wood. Are you a country decor lover? Do you adore rustic? Then wood is the way to go. Without the need to tear down your current backsplash, wood can easily be installed with liquid nails. There are so many types of wood to choose from that can give you a variety of results, changing the look and feel of any room. Tin. This material used to be highly expensive, and was only found in very expensive homes. However, faux tin sheets can provide the same look of elegance at a much more affordable price. However, you must proceed with caution as this material should only be used in small doses. Overusing it could give your design an opposite effect of what you were going for. Beadboard. There’s no place like a home with beadboard. It’s just as easy to install over your current backsplash as it is to install wood. Simply cut these boards down to your needed size, since they are often sold in large pieces. And with liquid nails, you can renovate your backsplash in no time. Mirrored surfaces. Becoming more popular now are surfaces that show reflection. Not only are mirrors known to give the appearance of more space, it has become a trending modern look sought after by those searching for a sleek design. When looking to renovate even an item as simple and overlooked as a backsplash, you can completely alter the look and feel of your kitchen. Our first assumption is that you have to tear everything down, but there are always alternatives that provide the same, if not better results.